While Alec Reed certainly had his own schedule to worry about last week in Ypsilanti, Michigan, there were times when the 11-year-old looked up at the track at Eastern Michigan University and wondered about his older brother, Aeneas. A part of him wanted to shoot through time. "How come that's not me?" Alec would ask of his 14-year-old sibling. 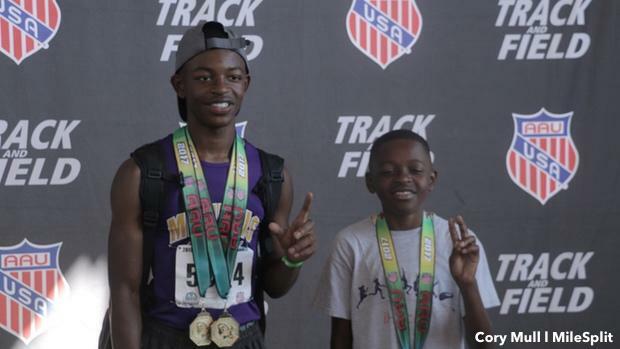 Aeneas won the pentathlon and long jump at the AAU Junior Olympic Games and was third in the 200m hurdles. Alec came in second in the pentathlon and was sixth in the 400m. "They're learning how to deal with competition at a higher level," their father, Aeneas Reed Sr., said. "What I want them to see is basically what they did to get here, just maintain that and try to stay on top." Soon enough, Alec may live up to all the family records his brother is currently creating on the track and in the field, but at least at this juncture, he's still a few meters away from making that happen. "I always think, how comes that's not me?" Alec said again. But the siblings, who hail from Eads, Tennessee, certainly made their names known at the AAU Junior Olympic Games from July 29-August 5. Aeneas was especially happy that after eight years of competition, he finally earned a gold medal -- two, in this case. "Usually if he sees me try to get a medal, he tries to do the same," Aeneas Reed Jr. said. They left with five medals all together, a healthy tally considering the challenge of events. Their family pedigree attests to their success in Michigan. Their parents, Aeneas Reed Sr. and Sylvia Reed, were former athletes themselves. Both siblings were introduced to track and field at a young age. Aeneas Reed Jr. began at six, Alec at five. "As parents you have to figure out what the talents are and build from that," Aeneas Reed Sr. said. "If they're naturally able to do it, parents shouldn't stifle them from doing it but encourage it." Especially for Aeneas Reed Jr., he was quick to attach himself to the oval. At least, after learning what it was. "On the first day of practice, I didn't even know what we were supposed to do," he said. "But later on, after I found out what it meant to me, and when I actually began to learn how to do it, I got through it." But in some ways, the brothers have chosen a path far afield from a city that adores the traditions of football and basketball, which has ruled the playgrounds of Memphis. "It's kind of a close-knit community in track," said Aeneas Reed Sr., a former hurdler and sprint relay athlete. "The city drives more toward other sports, but I see track more on the uprise." In the not too distance future, Aeneas and Alec could be cornerstones of the sport in the region. In Michigan, Aeneas Reed Jr. won the pentathlon in 2933 points, scoring a win in the long jump and running a time of 14.37 seconds in the 100m hurdles. The older Reed is ranked No. 1 in the long jump (21-0.75) and No. 13 in the short hurdles (14.37) for 14-year-olds. Alec is ranked No. 6 in the long jump (16-2.5) for 11-year-olds and in the top 30 in the 400m. He scored 2193 points in the pentathlon, finishing second. "Every year we're getting quicker and quicker," Aeneas Reed Jr. said. "Our times are going to drop faster." Aeneas Reed Jr. says he likes the way competition gets the most out of him. The rising freshman for Houston (Tennessee) High is looking forward to continuing his success at the high school level. "I usually look at winning and it gives me confidence," he said. His younger brother Alec is motivated by the way he competes, too. "He's better than most 14-year-olds and he's only 13," Alec said. Soon enough, though, the brothers will rise in the sport and could begin to help put the Memphis Mustangs Track Club on the map. In future appearances at the AAU Junior Olympic Games, Alec said there's only one goal. "To get gold medals," he said.